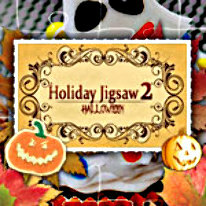 A new jigsaw game for Halloween! What'll it be, trick or treat? Trick or treat? No tricks! 500 brand new pictures will be a real treat for jigsaw fans this Halloween! Enjoy high quality images, convenient controls and help, and heaps of clues and tools to help you configure the game to your liking. Special tasks and trophies make the game even more entertaining. 500 new photos means 500 ideas for a costumes, face paint, party food and decorations on Halloween!